*Read before the Suffolk district of the Massachusetts Medical society, February 16, 1876. Wigglesworth Jr., Edward, (Harv. ), 1840-1896. 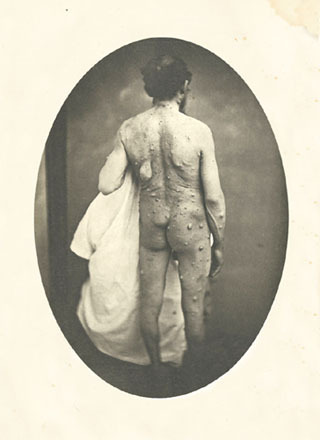 A Quarterly Journal of Skin and Venereal Diseases. Edited by L. Duncan Bulkley, A.M., M.D. New York: G. P. Putnam's sons, 1876. Volume II, April issue; pp. (193)-202 plus 1 plate. Photographer: attributed to Josiah Johnson Hawes. Cordasco, American Medical Imprints: 70-3948. A strong case can be made that this photograph is the work of Josiah Hawes who is better known, of course, for the exquisite daguerrotype portraits of Boston's privileged society which he made while he was partnered with Albert Sands Southworth. In addition to the technical mastery of the image, there can be discerned the same romantic distancing that is so characteristic of a Southworth & Hawes daguerrotype. There is an intelligence behind the arrangement of the hospital drapes that brings into sharp relief the scourged anatomy, and within a foggy backdrop there murks a strong vertical element, suggestive of the mysterious classical column that often appears as a prop in his daguerrotypes. 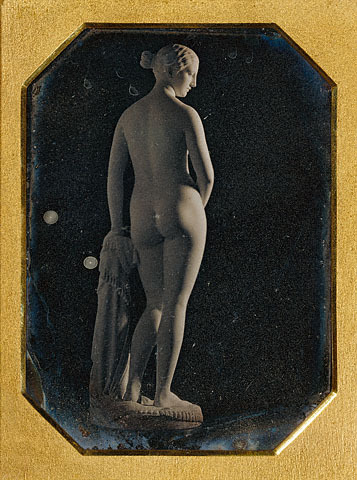 The image has an uncanny resemblance to the Southworth Hawes daguerreotype titled The Greek Slave which is part of the Getty collection. Because his studio was the most accomplished in Boston at the time, it is a consequence of innovative enterprise that Harvard trained physicians used his services. Hawes provided the eight photographic albumens illustrating Cases in orthopedic surgery written by Buckminster Brown in 1868. Brown and Wigglesworth both graduated and lectured at Harvard and both men are still remembered at the school by endowments in their names, Wigglesworth's for dermatology and Brown's for orthopedics. Hawes was present at the first public demonstration of the administration of ether by William T. G. Morton and the great Harvard surgeon John Collins Warren, but he drew faint at the sight of blood and was forced to leave. At the behest of Warren, he returned to the ether dome to provide the first photographic records of surgery performed with the aid of ether. In gratitude, Dr. Warren gave him the surgical instruments he used for this historical event, probably enjoying a wicked tweak at Hawes' delicate stomach. And finally, Josiah Hawes photographed for another Harvard medical man and witness at the ether dome, Dr. Henry Jacob Bigelow, providing him with images of pathological specimens during his surgical career at Massachusetts General Hospital. Wigglesworth does not credit the photographer who provided him with this image of "Fibroma molluscum", but he does mention that he contracted with Osgood and Company in Boston to burn and print the heliotype plate.